Gold prices kick started the year 2012 by vehemently rallying over two percent after an extended New Year’s weekend as investors piled up positions with conviction as their appetite for riskier assets like commodities improved amid encouraging economic reports from the US and world’s largest bullion consumer India. The yellow metal prices also propped up after the depreciation in American greenback against a basket of currencies made the dollar denominated commodity more lucrative for holders of other currencies. 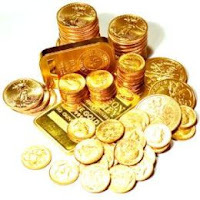 Gold futures for February delivery soared $33.70 or 2.2% to settle at $1,600.50 an ounce after trading as high as $1,608.70 and as low as $1,566.80 an ounce on the Comex division of the New York Mercantile Exchange, whereas the spot gold prices jumped $34 to $1,598.20 an ounce.